Adelaide, Dec 6: James Anderson's five-wicket haul and skipper Joe Root's defiant 67 kept England in the running for a comeback win on the penultimate day of the second Ashes Test here on Tuesday. Root remained unbeaten on 67 as the visitors posted 176/4 at stumps, still needing 178 runs for an outright win in the historic day-night Test. Chris Woakes is the other unbeaten batsman on five runs from eight balls. 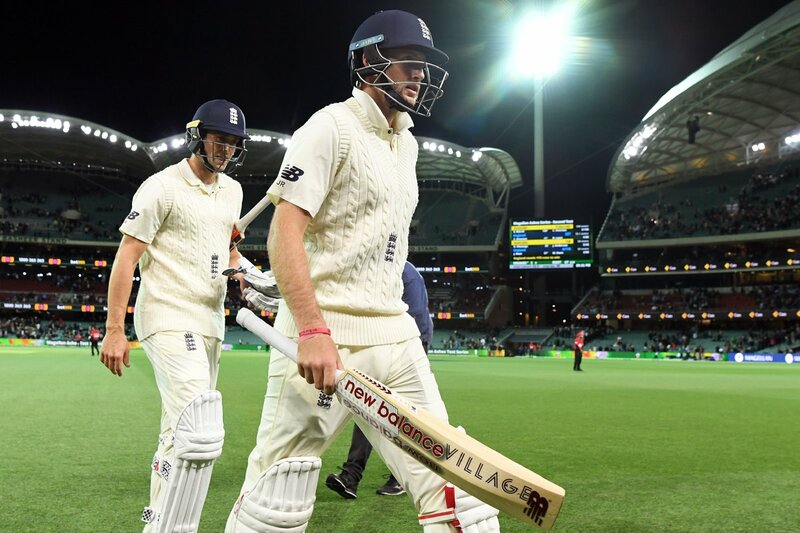 With a first Test win in Australia in nearly seven years in sight, Root played well for his 114-ball 67, his innings studded with nine fours. Dawid Malan looked good during his marathon 80-ball 29 before a Pat Cummins snorter packed him back shortly before the close. Earlier, Anderson (5/43) and Woakes (4/36) fired England's resurgence when they did the lion's share of the work to dismiss the Australians for 138 at tea. England were set a target of 354 for victory to level the series after last week's 10-wicket Brisbane defeat. The tourists made a steady start before losing openers Alastair Cook (16) and Mark Stoneman (36). Nathan Lyon (1/37) and Mitchell Starc (2/65) took the wickets respectively. James Vince departed shortly after, caught in the slips off Starc for 15 before Root and Malan stitched together a 78-run stand for the fourth wicket. The hosts resumed the day on 53/4 with Peter Handscomb (3) and Lyon (3) batting. Anderson picked up where he left off in Monday's night session, dismissing nightwatchman Lyon, Handscomb and Starc to snare his maiden five-wicket haul in four tours to Australia. Woakes scalped the wickets of Tim Paine and Shaun Marsh. There were two Decision Review System (DRS) calls which went in England's favour. Root first overturned an lbw decision off the bowling of Nathan Lyon and Smith had a failed review when the Australian suspected an inside edge. Smith then left his team with no referrals for the final day when he pursued an lbw decision against Malan only for the tracking to show the ball would have gone over the wickets. Brief scores: Australia: 442/8 decl & 138 (James Anderson 5/43, Chris Woakes 4/36) versus England 227 & 176/4 (Joe Root 67 not out).